Egypt’s president has a simple solution for activists who protest against his draconian laws criminalising public assembly. Jail them. No one can claim that the president of Egypt, Abdel-Fattah al-Sisi, hides his disparaging view of human rights. “Take care when you are demanding your rights, take care, don’t lead us astray with you,” he warned potential protesters while addressing police officers in January. Arbitrary and politically-motivated arrests have soared since al-Sisi, then defence minister, seized power in July 2013 from Egypt’s first democratically elected president, Mohamed al-Morsi. An Interior Ministry official in July 2014 acknowledged that authorities had arrested 22,000 people over the previous year. The Egyptian Centre for Economic and Social Rights, which independently monitors political arrests, said that the number was more like 41,000 arrested or facing criminal charges as of last May. There is little doubt that Muslim Brotherhood members and alleged supporters of Morsi constituted the greatest number—Brotherhood leaders said 29,000 of their number were in custody. But the arrest campaign includes numerous secularist and leftist activists as well. 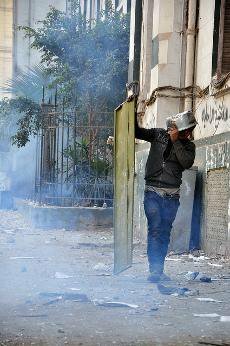 Against the odds: peaceful assembly in Cairo is heavily constrained. Flickr / Mohamed Azazy. Some rights reserved.And of course once in custody they are subject to the same abuse and intense overcrowding. According to an investigation published in Al Watan, an independent daily which generally supports the government, drawing on statistics from the Justice Ministry’s Forensic Medical Authority, at least 90 detainees died in police custody in Cairo and Giza governorates in the first 11 months of 2014, from inhumane conditions, inadequate health care and in some cases torture. Those arrests have frequently been for violating a decree of 24 November 2013 (Law 107) empowering the Interior Ministry to ban any gathering “of a public nature”, on vague grounds such as “influencing the course of justice”, and authorising the use of force to disperse demonstrations. Alaa Abdel-Fattah, a prominent opposition activist who has been in and out of jail since the days when Hosni Mubarak was president, called for a demonstration two days later, on 26 November, to protest against the continued military trials of civilians. Police used water cannons and batons to disperse between 200 and 300 protesters, and arrested scores, including well-known activists like Mona Seif, Nazly Hussein and Salma Said; human-rights lawyers like Ahmed Heshmat, Mohamed Abdelaziz and Osama al-Mahdy; and the journalists Ahmad Ragab and Rasha Azab. A criminal court housed in the infamous Tora Prison convicted Abdel-Fattah and 24 others of violating Law 107 and sentenced them to 15-year prison terms and hefty fines. On 23 February 2015 an appeal upheld the convictions but reduced the sentences of those in custody—in Abdel-Fattah’s case to five years. Abdel-Fattah was not alone among the prominent secularist activists jailed on grounds of violating the November 2013 protest law. On 21 December that year, a court sentenced Ahmed Maher and Mohamed Adel, founders of the 6 April movement that helped spark the 2011 uprising, and a fellow activist, Ahmed Douma, to three years in prison and fines of more than $7,000 each. The charges included violating Law 107. As in most of these cases, authorities also lodged charges of “thuggery” and assaulting police officers, although in incidents Human Rights Watch was able to observe and document the only evidence to support these allegations appeared to be the testimony of police officials. Maher had not been reticent to criticise the “stupidity” of Morsi and the Muslim Brotherhood and his own “mistake” in supporting al-Sisi’s coup. He concluded that “everything we rose against in the January 25th  revolution is back and worse than before”. Another prominent victim of Egypt’s headlong return to repression is the 28-year-old Yara Sallam, a human-rights activist working with the Egyptian Initiative for Personal Rights. She, too, was a victim of the draconian anti-gathering decree, although it’s not even clear that she was participating in a demonstration—men in civilian clothes seized her while she was buying water at a kiosk. In her case, too, there appears to be no basis for police allegations that she and a score of others arrested in the same incident, on 21 June 2014, had weapons or any violent intent. “Working for human rights organisations is not as legal as everyone thinks it is in Egypt,” she said. “Everyone in this field is working knowing that he or she can be arrested for any random reason.” She is now serving a two-year sentence. Journalists are among those detained on charges that are trumped-up at best. Many are familiar with the travails of the three Al Jazeera English journalists—Peter Greste, Mohamed Fahmy and Baher Mohamed—who are finally out of prison (though Fahmy and Mohamed still face a new trial on the same outlandish charges of supporting the “terrorist” Muslim Brotherhood). Sending Egyptians to prison for simply exercising their rights to freedom of expression and peaceful assembly is likely to become more extensive under the new “terrorist entities” decree issued on 26 November. It defines “terrorist” in extraordinarily broad terms: in addition to language about violence and threats of violence, the law covers any offence which in the view of authorities “harms national unity” or the environment or natural resources, or impedes the work of public officials or application of the constitution or laws. A “terrorist” is anyone who supports such an entity—and support can include “providing information”. Imagine the wide net that can be cast if “providing information” which “impedes the work of public officials” or “application of the Constitution” constitutes a terrorist offence. These new laws supplement existing Penal Code articles such as 98(f), which prescribes prison and a fine for “exploiting religion” in any manner that “promotes extremist ideologies”, “stirs sedition”, disparages “any divine religion” and prejudices “national unity”. Such ideas recently earned Karim Ashraf Mohamed al-Banna, a student, three years in prison for a Facebook post, as part of what appears to be a co-ordinated government crackdown on perceived atheists. Egyptian authorities have long relied on article 98(f) to prosecute members of religious minorities, dissident academics and artists who, like the 22-year-old blogger Karim Amer back in Mubarak’s day, “spread information disruptive of public order and damaging to the country’s reputation”. President al-Sisi and his entourage have put in place a highly repressive order. With the revival of arbitrary arrests, torture in custody, disregard for civil and political rights and extremely limited tolerance for public criticism, they are doing more than anyone to damage Egypt’s reputation.